Thank you to Ubisoft for sponsoring this post. Please visit Amazon.com to get your own copy of Far Cry 3, today's Gold Box Deal of the Day! I was selected for this opportunity as a member of Clever Girls Collective. All opinions are my own. As a lot of you know - I am a very stressed person. It seems like I can almost never get a break.. There is literally always something happening in my life to stress me out. Fortunately, because of that, I know the best ways to help me relieve stress. I really have 2 favorite ways. One being, watching a funny television show, or a movie, and two would be playing a video game, and just getting lost for a bit. I have a huge collection of both movies, and games - But if I had to pick one, I would say gaming does relieve more stress than watching movies. When you watch a movie you forget about whatever is going on to stress you out - For probably a good 2 hours. But as soon as it's over, you usually remember, and then the stress starts all over again. With a good game, you don't really have that problem - You can play for as many hours as you'd like. And my favorite part, is that you can completely get lost in a game. It's like you become part of another world, and you just completely forget about any stress going on in your life. The best type of games in my opinion are the ones where you can role-play, and really expand your character. Far Cry is definitely one game series that I am a huge fan of. I've played countless hours in the past, and really love the first-person shooter setting, and to be honest, I just love the excitement, and surprise of the game. The graphics on Far Cry 2 were super awesome, and I just can't imagine how amazing they are in Far Cry 3! It will most likely make you feel like you're actually there shooting. Definitely a great way to relieve a little stress, huh!? Melt into a game, and just play for hours and hours. 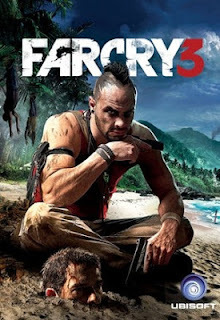 If you're a gamer, or you just love relieveing a little stress, definitely consider Far Cry 3. "Explore a beautiful and diverse island playground - lush jungles, mountains ranges, swampy grasslands and sandy beaches. Explore lost Japanese bunkers, ancient temples, secluded caves, shipwrecks, abandoned compounds and more. Race through foliage, fly over deep canyons and traverse the island with hang gliders, boats, trucks, jeeps and ATV's. Or for the expedition adventurers, use fast travel between any two save locations." If this sounds like an awesome game to you - Or you're looking to relieve a little stress, and pick up a new, awesome game while you're at it - Check out Far Cry 3; Today it is the Gold Box Deal of the Day on Amazon! "Amazon Gold Box Deal of the Day: Far Cry 3! To buy: http://clvr.li/FC3Gold - RT to enter to win a copy! #FarCryGold"
This game has a rating of M, for Mature. Disclosure: I am receiving a copy of Far Cry 3 in exchange for writing this post. All opinions expressed within this post are my own, and were not influenced in any way. I wish I could be a gamer bc gamers are cool, but I am just not coordinated enough to play video games! :) I am really bad at them and I don't have the patience to keep trying! I have never heard of this game before. Looks violent? I think my teens would love this game. Thanks so much for sharing. Not my kind of game but I am sure plenty of people will enjoy it. I retweeted My hubby really wants this game. WE don't play video games. I am not a gamer in the least, but my husband games. He's even on a crew? IDK but they are really good in their world and he plays all night long on his nights off! Hello from your newest follower. I know my teen son would love this game! Hope you can stop by my blog sometime, have a great weekend! I passed on this game, but would love to know your thoughts on the game for kids? Do you feel like the graphics and language are too much? I have a tween. Thanks! I definitely wouldn't recommend the game for young children. It's rated M for Mature. Thanks! I appreciate your honesty. My 12 year old thinks he mature...sigh...he's far from it! I wonder if this would be a game the hubby would enjoy. We also love to play a great Xbox game to relieve stress. Played it, loved the gameplay and the big open environment.